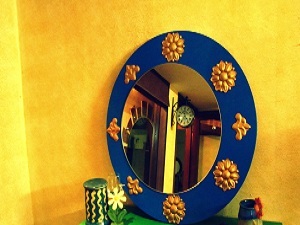 Round, rich and deep blue is this mirror called Jaala inspired by my travel to Hampi (India). This mirror marks the infinite water reservoirs and the riches of the kingdom of Vijaynagara. Made with plywood with MS motifs hand-painted to look beautiful.